The User Management section of FunnelFlux lets you create sub-users and set granular permissions for what they can see and do. Here I'll show you some of the permission abilities and run you through how you could create sub users for partners, assistants and media buyers. Important note - restricting views etc. doesn't restrict stats, as right now the queries do not filter by the available sources, landers etc. To do this simply click New User, fill out their details and toggle all permissions to enabled. This user will then have access to all features and functions. This will ensure the user can see all relevant data but cannot execute data updates, update the application or modify anything. Ideal for someone who needs to just run reports and view stats. You may have situations where you have a media buyer who needs access to edit and modify campaigns, landers etc. but you don't want to let them interfere with other user's configurations. While we can't limit the stats they can see on a per-user basis, since this would require all database queries being filtered by permissions - not yet a feature we offer, we can limit what they can see and access everywhere else. The key to doing this is using the "restrict by" options for campaigns, offer sources, etc. An easy way to do this is to create categories for landers/offers that are specific to the media buyer's access. For example, you could make a lander category called "Gaming Landers" and allow only certain users to see this. You could also make categories in the name of the user and restrict each user to only see their own. 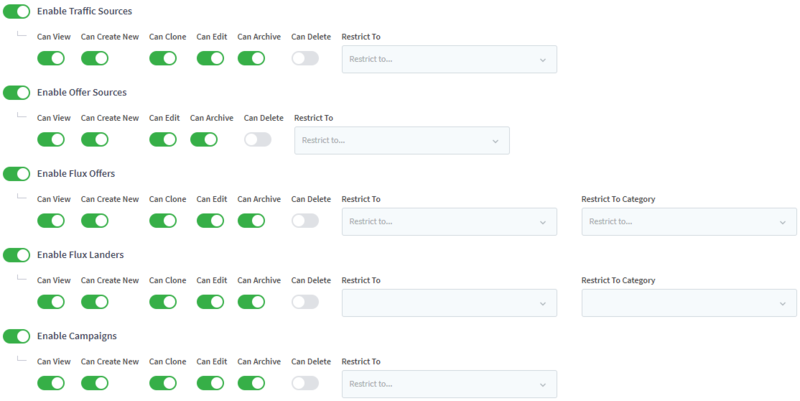 You may also want to keep the "can delete" toggle off so that media buyers cannot purge these, only archive them, as the delete function for campaigns will delete their associated data. Deleting landers/offers does not, but will affect nodes in funnels and if there is any crossover usage of landers and offers in funnels used by others, this could be detrimental - so its wise to prevent accidental deletion. As a useful example, if you want to give us support access but only want us to be able to see the funnel setup for specific campaign(s), landers etc., you could add "restrict to" options to the support user to limit our visibility. It's sensible to enable/disable our support user as needed if you feel you have sensitive information, since limiting user access is just good security practice. Restricting the user access further is up to you - a bit of a chore, but useful as an exercise. If we are investigating issues with a certain campaign, just be sure to provide access to that campaign, associated landers, offers and the relevant traffic/offer source so that we can check every aspect to troubleshoot issues.